Board index ‹ Peugeot RCZ ‹ Peugeot RCZ Technical Discussion ‹ Lights & Electrics ‹ What is your voltage at idle and while driving? What is your voltage at idle and while driving? Please share: What voltage you get when idling and being driven. I have a 2010 RCZ 200THP. My battery was up for replacement and I thought i would give a Lithium [LiFePO4] battery a try. I purchased a Lithiumax battery which is meant to have more CCA and AH than the standard lead acid battery. http://www.lithiumax.com.au/_p/prd1/407 ... ry---bonus! I had problems where the battery doesn't seem to be charging after driving. I replaced the battery and it still seems to be having issues. The seller of the battery thinks i might have a problem with my car electrics and suggested i take it to an Auto Electrician to diagnose. I wanted to get an understand what the normal voltage you guys see when your car is idling and when it's being driven. Mine is currently reading 12.7 Volts while idling and 13.1 volts while driving. Both of these figures seem a little low to me from what i can gather, i've read they should both be around 14V on standard older cars. Does our ECU control regulate how much voltage the alternator creates? I read that our car can reduce the voltage to increase fuel efficiency, but this is causing a problem for me. 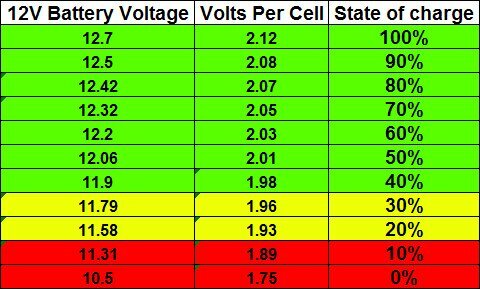 Otherwise it may seem that a LiFePo4 battery may not be suitable with our cars as the voltage required for 100% SOC is 13.3v vs 12.7V of lead acid. Re: What is your voltage at idle and while driving? Think that lithium batteries are different to normal batteries. I fly a drone now and again using lithium batteries and when charging they have to balance themselves across the cells which takes time and less volts are going to the cells due to the balancing. I'm not sure the RCZ has the smart charging system. I know the 1007 has the smart charging system and you also have to use a special silver type battery. Think what I've said is correct but other will be along to add their comments and to say if I am correct in my understanding. I have the same device as DKZ and I get the same result at idle ... 14.1 / 14.2volts, this changes when driving because the alternator is being driven and I get 14.4v - 14.5v which shows a healthy alternator. I bought this device to check my battery and alternator before deciding which one was faulty, ( it only cost a few quid of fleabay ), it turned out my battery was dying and not holding a charge. If you get results like above when the engine is running, then you have a healthy alternator and if your battery is still low after a run or is causing spurious electrical faults, then the battery is 100% shot. This is a sure test to check alternator / battery faults - you can also use a volt meter but this is easier. If you do not get the results above, then you have a bigger problem in that it lies with your electrics - probably the alternator. Good luck with your issue - please report back on here your results / repair as it might help others in the same predicament in the future. I also finally did the voice enrollment and the speech recognition is actually usable now! Funny that you've just jogged my poor memory ! I was going to ask if anyone has set up the voice commands on the audio system. So I for one will be very interested to hear about your methods and results ! !